The 44 metre motor yacht MAG III, listed for sale with Stuart Larsen and Josh Gulbranson at Fraser, has had a price reduction of $1,000,000. Built by Italian superyacht builder Benetti to ABS class, MAG III is one of the yard's Vision 145 series of full displacement yachts, designed by Stefano Righini and delivered in 2009. MCA compliant, she accommodates up to 12 guests in a five stateroom layout. The master suite offers an impressive 270-degree view and has ample wardrobe and storage space, and there are a further two VIP cabins with queen size beds and two twin cabins, each with Pullman berths. 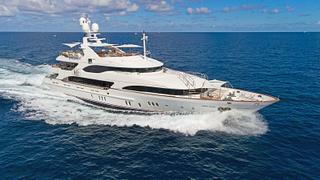 There are also quarters for nine crewmembers aboard this yacht for sale. The well appointed cabins have marble en suite bathroom facilities and have on demand film and audio through a Kaleidescape server. Her interior was designed by Bannenberg & Rowell and includes a central glass elevator and a light main saloon with stylish wooden floors in dark and light stripes. Her aft deck is very spacious and features built in seating, two chairs and a large table for al fresco dining. An impressive sundeck has a Jacuzzi spa tub surrounded by teak decking and loungers, a seating area and tables. Further forward is a wet bar with three stools. Twin 1,300hp Caterpillar engines give her a cruising speed of 14.5 knots and a range of 4,000 nautical miles at 11 knots. MAG III is now asking $13,250,000.